Dubai: The coach and skipper of Arsenal are confident that the momentum gained by the team during their short break in Dubai will help them rejuvenate for the remainder of the season. The 22-member Arsenal squad, led by coach Unai Emery, visited the palace of Shaikh Hamdan Bin Rashid Al Maktoum, Deputy Ruler of Dubai and Minister of Finance, late on Sunday and left hoping the Dubai visit will help them achieve team goals. We’ve got the winning momentum and we should be able to stay together as a team and help with the goals set by the coach. “Nothing less than a spot in the Uefa Champions League,” skipper Laurent Koscielny told Gulf News when asked about the target for the season. “We’ve got the winning momentum and we should be able to stay together as a team and help with the goals set by the coach,” he added. 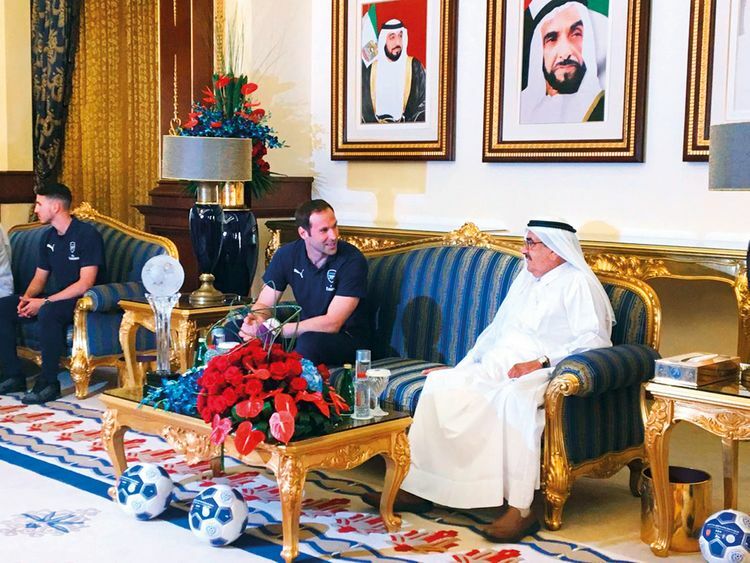 Shaikh Hamdan, who has been the Chairman of Al Nasr since 1960, was in conversation with Petr Cech during their brief stay at the palace. Emery, who was seated with Shaikh Ahmad Bin Saeed Al Maktoum, President of Dubai Civil Aviation Authority and Chairman of the Emirates Group, maintained that their Dubai stay had assisted them to maintain the momentum. “With a break like this, the most important aspect is that of continuity and we have managed to have this due to the excellent facilities in Dubai. We have set goals for the end of the season and I think we have enough spirit to achieve this,” Emery said. “We could have stayed back in London and done the same work. But here, we have the added advantage of some good weather and a change of location that can help us get better as a team,” the coach said. “We need the confidence and the rhythm heading into the last part of the season,” he noted. Arsenal’s next fixture in the English Premier League (EPL) will be against Newcastle United on April 1, followed by an away game against Everton on April 7. However, the Gunners will be fancying their chances of sealing a Uefa Champions League berth for next season by winning the Europa Cup when they take on Napoli in the quarter-finals on April 11 and 18. Ahmad Khoury, vice-president, Board of Directors at Al Nasr revealed that Arsenal have promised to return for a Hamdan Bin Rashid Challenge Cup next season. The Gunners will sign off their stay in Dubai with a friendly match against Al Nasr, which kicks off at 5.30pm on March 26 (Tuesday). Tickets, priced at Dh100 (Category 3) and Dh150 (Category 2), are on sale on Platinum List at the Al Maktoum Stadium.